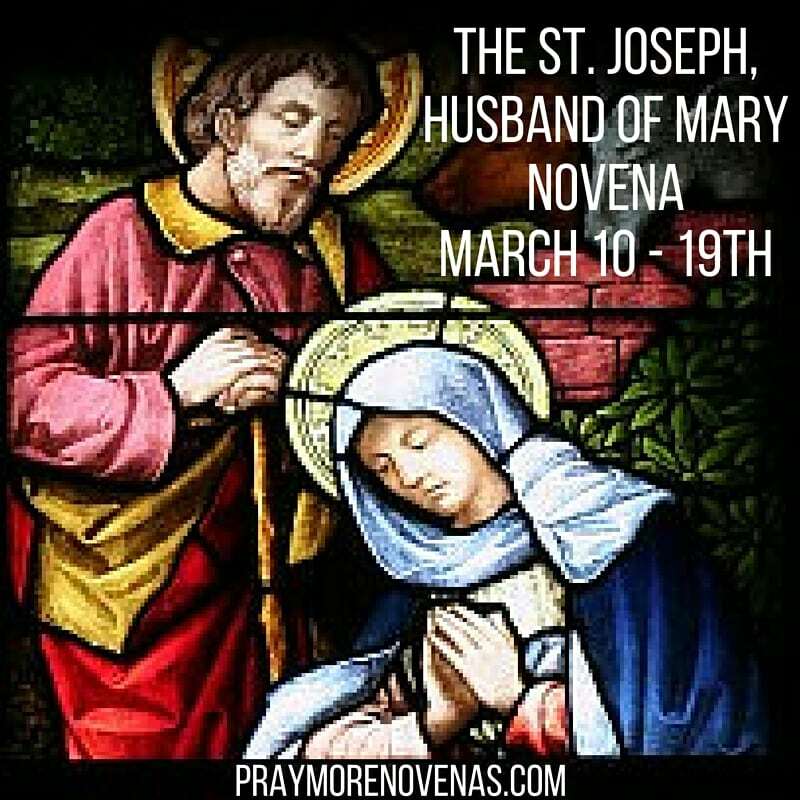 Here’s Day 9 of The St. Joseph, Husband of Mary Novena! After 8 years of marriage My husband left us (Me and my daughter) again. Last 2016 he left us because he had another woman. He comes back 1 Year after. I forgive him for what he did to us. Then Last week he left us again. I don’t know where he is now. He just left without saying goodbye. My heart is aching. I don’t know what to do. Please pray for him. That he is ok wherever he is. I’d still love. I’m just waiting for him to comeback again.Please help me. Holy Spirit please I ask you to Decend upon all the members of my family and please help them to return to the faith, the Holy Mass, and the sacraments. Please I ask you to increase my faith and help me to love Jesus more. Please Holy Spirit I ask you to grant that my daughter’s scans and oncology tests will have a good result. I thank you JESUS for all her healing so far, please keep her healthy and well. Please help A. to find a holy life partner and be happy and content.Please grant that G. will stay well and get a place on the course that she has applied for. Please grant that my son’s new business will succeed and that he will find a holy life partner and be happy and content. Holy Spirit Please grant that all my family will stay healthy and well and do God’s Holy WILL always. Please also grant Healing to little Aidan for his memory to recover after chemo. In JESUS NAME I ASK FOR ALL THESE REQUESTS. JESUS I TRUST IN YOU & THE HOLY SPIRIT. THANK YOU FOR EVERYTHING THAT YOU HAVE DONE FOR ME AND FOR ALL MY FAMILY. Dearest St. Joseph, my Father, please intercede for Erin and Ryan today, bless them and make them holy. Bring them back to God. Watch over my grandchildren and protect them. Strengthen Michael. Please pray for healing of the last vestiges of my illnesses, sanctify me and bless me with peace. Thank you for the job and prepare me to serve God through my work. Please bless me with a holy and caring companion to become my husband. Help us to grow together and share this journey. Or pray that this desire will be removed from my heart. In thanksgiving for all the blessings you have bestowed on me. Thank you for always being there for me and always being my Father. Blessed St Joseph intercede that l may cherish my husband and help him as he gets older. Lift this dreadful early morning depression from me and make me happier that l can be of use to my family in their daily struggles. In the name of the father.Amen. I am praying to receive an offer for a particular job that I interviewed for. St Joseph, thank you for your intercession on the behalf of God’s faithful. I picture you taking our prayers to the foot of the cross and my heart breaks because we are the reason He suffered, yet He wants us to come to Him. I humbly ask that all of our prayers be answered and that we all happily accept His will. I also ask that the others praying here will offer a prayer for my intention, for my terminally ill brother in law to come to Christ through baptism and seek the will of God before he leaves us. I passed the PMP (project management professional) certification yesterday through the intercession of St. Joseph! Thank you St. Joseph! That our son Mario be blessed with a Teaching position this up coming school year in this your name we pray Amen. I pray that my daughter becomes the kind of wife and mother that Creator wants her to be. No drugs, no alcohol. I pray that the custody of my grandson Andre is granted to be until his parents are released from incarceration. I also pray to be blessed with a life partner/companion. Someone who will love me and my children/grandchildren like his own. All this I ask in the name of Jesus, Amen. I’m praying to St. Joseph to help me to move back to my country. Dear Saint Joseph, thank you for listening to me during this novena. Please intercede to dear Jesus for me, and ask Him to hear and answer my prayers. Please ask Him to let me know what His will is for Luis and me. Please ask Him to show us what we need to do regarding the choices we must make regarding our marriage. Please strengthen us to accept Your will and do what we must to find peace and happiness in our lives. I pray to not hurt each other or our children. I pray to know what Your will is and to accept it and do what pleases you. Thank You for all you have done for us. Thank you Saint Joseph for interceding for us. Thy will be done. In Jesus’ name. Amen. I pray for your intercession that my famliy will be protected from the snares of the devil.Lord God, pls shield my father, bless my mother and siblings. I pray for conversion of my family members esp my sister who now finds growth in non-catholic teaching. Win her back to Jesus and Mary. I pray too that I am going to accept God’s will for my life. I know I desire to get married but it seems the prevalence of history of failed relationships comes through time. Whatever the hindrance maybe, I bind it in the Holy blood and water of Jesus and please ask Jesus to heal me and all my past relationship from repeated failure. If I, in the future, will be a wife, I pray that I am going to love, respect, pray and support my future husband. Whatever will be the result of my Novena. I humbly would like to thank you and the Holy Family. In Jesus, Mighty name. Amen. Pray my nephew and his soon to be wife will return to the Catholic Faith. Pray their wedding on May 26 will perfect and the beginning of a strong and holy marriage where they will love, support and pray for each everyday of their lives. Pray the closing of our house will be soon without complications. I pray for gainful employment. Dear St Joseph please help Wayne feel the Joy in life through painful knees and shoulders. Please guide him to receive the surgical procedures that will restore him to health. Please give him Joy as he suffers through clinical depression knowing that God’s plan is perfect for him. Give me strength in knowing and trusting the Lord in this situation thank you st Joseph. I ask all this in Jesus Name Amen. St Joseph help me as I’m preparing for my marriage I bring my fiancee (comfort) to your holy family for your guidance, I need your wisdom to lead my family in a Godly way amen. Hello! My prayers have been answered today. I had a peaceful and enjoyable day with my kids. Thank you so very much!!! Please continue to pray that my family continue to be kind to one another. I was so happy that one of my daughters invited me to watch a movie with her and her friends in our livingroom. Praised God!!! Thank you Jesus!! Hallelujah and Amen, the work of God be praised always ????? ?